He is the man behind King’s short story The Revelations of ‘Becka Paulson. SKSM: When did you make The Revelations of ‘Becka Paulson? Can you tell me a little about the production? How much did it cost? How long did it take to film it? 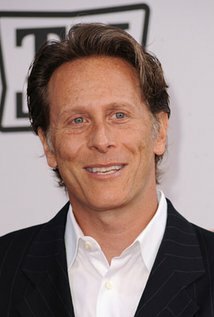 Steven Weber: My association with Stephen King began before that when I did the miniseries version of “The Shining” (directed by Mick Garris). I found the original story in an anthology of horror and fantasy tales that I picked up and thought it would make a cool little film. I contacted the Outer Limits people, who I knew, and suggested the project. They liked it and off I went. The entire production was roughly two weeks (one week of pre-production and one week of shooting). I’m not sure what the cost was. It couldn’t have been much. SKSM: How come you picked The Revelations of ‘Becka Paulson to develop into a movie? What is it in the story that you like so much? Steven Weber: I liked the humor in the writing and thought that The Outer Limits could use some humor ion their programming. Steven Weber: Working with Catherine O’Hara was very special for me. I had always been a fan of hers and was very impressed with her choices and her ability. As it was my first experience directing, every moment was special. Steven Weber: I did a “director’s cut” that had a different approach to the overall editing of the episode that I preferred. I felt that the final product was a little too linear. I tried to enhance the feeling of the character’s insanity through editing and through funny off-beat music. The producers thought my choices were too odd and they wouldn’t pay for the rights to use the music, instead opting for more generic music. But enough of the elements I like have survived. Steven Weber: I had no contact with him during the filming. I did, however, have a lot of contact with him during the filming of “The Shining” and found him to be extremely open, funny, approachable and fascinating. I think he liked “Revelations”. At least, I hope he did. SKSM: How did you get started as a director and what do you do on a production? Steven Weber: I started directing as a fluke, having been around it for so long a time as an actor. I absorbed aspects of it and always was observant and when the opportunity arose I leapt at it. Steven Weber: I had always been a fan of the horror/fantasy genre (I just wrote and acted in an episode of an upcoming series called “Masters of Horror” that was directed by Dario Argento. It seemed fitting that my first foray into directing would be something from that world. Steven Weber: Not at this time. Steven Weber: Only to say that Stephen King is worthy of all the adoration his fans have mustered and that he is as real and remarkable as any fan would hope him to be.